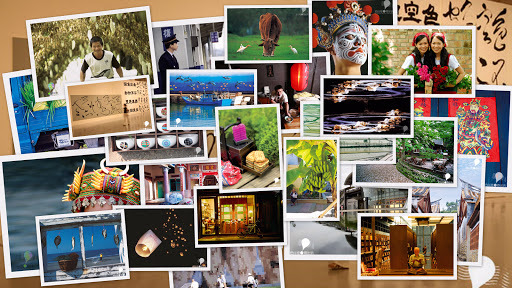 Postcrossing had started to be popular in Taiwan since last September. The web forum, however, was not a common disgussion place for Taiwanese internet users, so people here did not get to know each other as a club or a group. 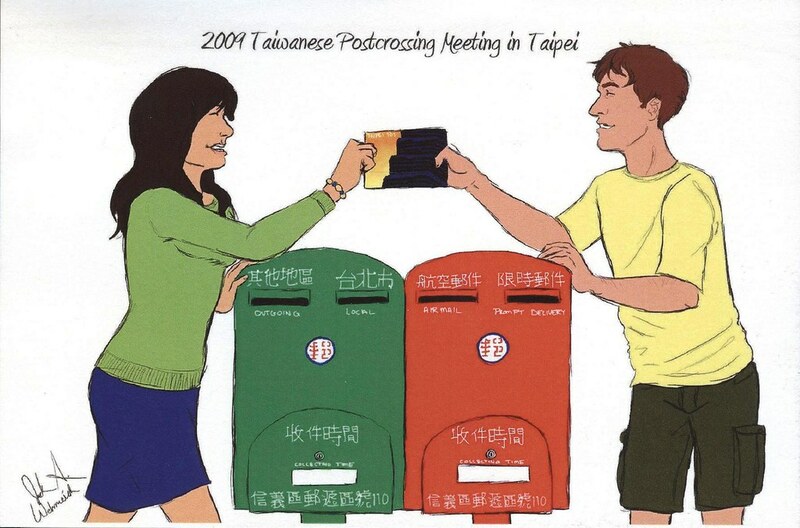 However, a diligent Dutch mother, who sent the most postcards from Taiwan, sent out a proposal through personal message one by one in March, 2009, and made people going to the forum to see what would happen. 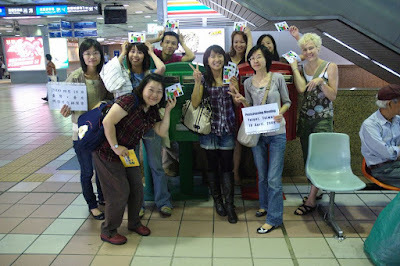 12:00 noon, 18 April, 12 postcrossers met in Taipei Main Station without any detail plan but their favorite postcards. 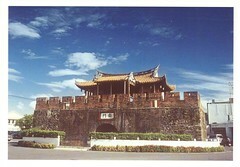 Although most people came from Taipei, there were a man from the northernmost city,Keelung, and a woman from the southernmost county,Pingtung, crossing over 400 km. They went the food court to have lunch, but that was not important at all. Not untill everyone finished their lunch, someone already took out his/her postcards. Everything happened so naturally. They chatted about the experience of postcrossing, the interactivities with other postcrossers in foreign countries, the place to collect postcards, and so on. And the most important, writing postcards. 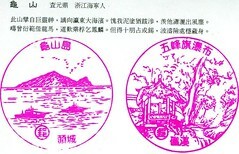 A souvenir postcard was designed by a American designer who was asked by a Taipei postcrosser not showing up, to commemorate the first meeting in Taiwan. 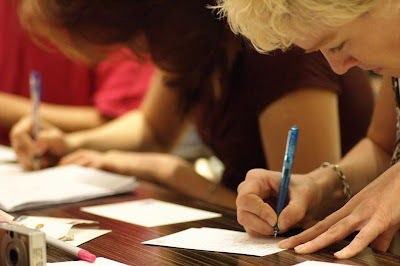 Everyone wrote the postcards so hard and were very happy. At the end, they went to the post office to mail them out. Wait and see, maybe you will get one of the meeting postcards. I got my souvenir postcard today. Joanna helped me to mail it. So I did not know what everyone wrote. The message was a surprise, like a three-day time capsule. The English word for this kind of boat is kayak. It does not imply any single stuff. But in Chinese, 獨木舟, it means 'make in one single piece of wood' or 'handle by one person'. Hsu had gone to Penghu to serve in the military without no one, and he had said he is lonely several times. But he is not alone now. He is just the first one going to Penghu and gets more experience than his friends, like those kayaks laid on the beach together. There are nature human heads everywhere in the world. They look up, look side, in the river, in the lake and at the beach. 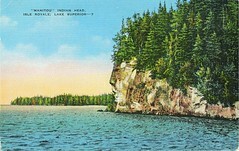 This shapely one in the Lake Superior with those trees crown looks sedate. If it were a real man, he must be a resolute chief. What makes a city a capital of a country? It is hard to tell. I promised a friend living in Canberra, the capital of Australia, to send him a postcard. Taipei is the capital of Taiwan, so I decided to find some capital image from capital to capital. 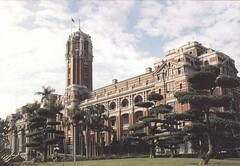 The Presidentail Hall of Taiwan is not the greatest building in Taipei, but as the office of the president, it is representative enough. I went the southern end of the Taiwan island for a work trip. 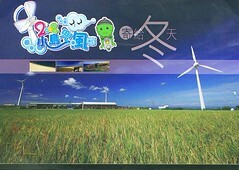 Before going south, I bought two sets of Pingtung postcards. 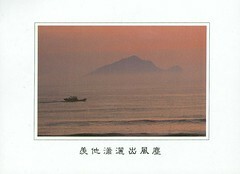 I also pickec up one from the post office official Taiwan scenic set. I think sending a postcard is a good way to let friends know what you are doing immediately. Or you would never have a chance to talk about the trip. Pabellón Qingyin, uno de los diez lindos paisajes de la Montaña Emei. 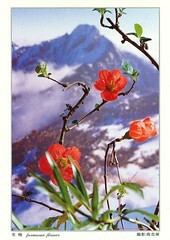 This is a UNESCO postcard from south China. The description is in Spanish. I worked out on that for a while. I thought the first two words was the name of the Place and checked all UNESCO list of south China. 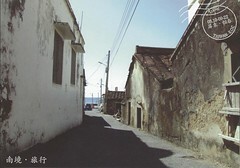 But I forgot that Chinese like to send postcards of places far away from their place. 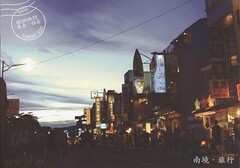 This postcard is about the place in Sichuan. 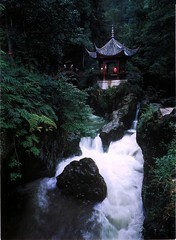 It is Pavilion Qingyin, which means the pavilion with clear and melodious sound from the river. I was too busy to write anything on the postcard on the trip, so I left the place in blank. When I dorped it to the mailbox, it stucked. The mailbox was full of letters and postcards. I wondered what were be written and sent? I hoped they tell their friends the beauty of the nature in this National Park, not only the party they had and the busy night market. 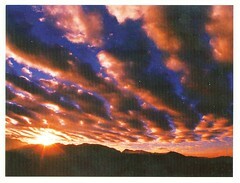 I bought this postcard in mid-January when I was in a trip to the south of Taiwan. This picture is about the flower, plum in the mountain Ali. 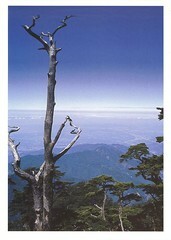 (we call the mountain, Alishan.) 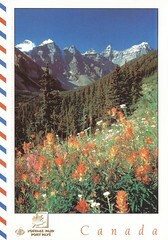 I choose this postcard because I saw you sent out some plant postcards. Also, the background is another mountain in Taiwan. It's the highest mountain Yushan, Mt. Jade. 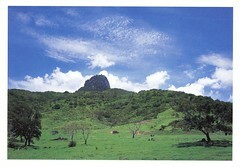 It's 3,952 m high and is in the National Park. Of course it is a landmark. 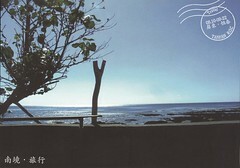 When I got this postcard, I thought that they have the sea-like water view. But Foss family said they live in a small farming village of 400 people in the center of Wisconsin. I check their village. It is about 300 km from the lake shore. What a great country! I have been to Ontario but not Michigan. Michigan is the only Great Lake totally in USA. 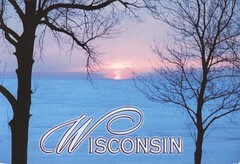 I think Wisconsin section lake shore must be a peaceful section. This is a painting of Raija Nokkala. It is usually hard for me to have feelings to cartoon postcard. I can only say it's cute. Well, fish on the balloon, in the air, the balloon in the hands. Lucky cat family. Two weeks ago, it was life science week. Department of life science had book sale, and photos, postcards and so on. I bought this card there. It's a tree frog. 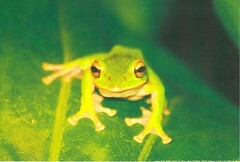 There are ten species of tree frog in Taiwan, and seven of them are only found in Taiwan. Taiwan is an island located in a very good place for life creatures. We are at subtropical and tropical boundary, so the weather is just right. 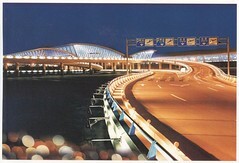 Pudong Airport is the newer airport in Shanghai. An airport is an interesting place. It is not like a plane which can carry people to realise their dream or bring them back with trophies. 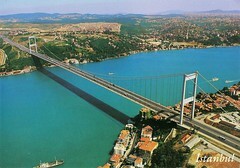 But here is the place for reunion or seperation with friends or family. Shanghai as a rapid growing city has many immigrants. There must be a lot of stories begining there. I feel a little bored today, so I mark all postboxes cloesed to me which I use most often in Google map. The post office provides a webpage to check all postboxes online. However, this map is much meaningful to me and I think it a good way to discover one's community by making his own map. 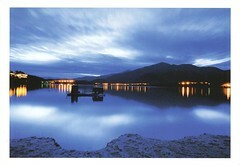 Sun Moon Lake is in the central Taiwan and is a popular tourism destination for most international tourists. It used to be smaller, but after a dam was built, it expanded and became bigger. There are some special kinds creatures in the eco-system. 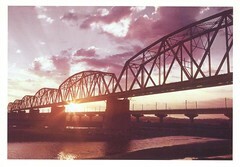 And because of the beautiful scene, it's surely a treasure of our country. Maria, a Russian girl, sent me this Canadian postcard of Reuters. Although it is not a Russian postcard, she drew some cute icons of Russia, Kremlin, bear, and vodka. I just checked the transportation for Vancouver Island. It takes about one and a half hours by ferry. 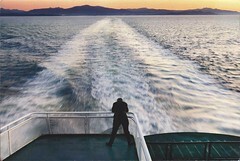 This picture is showing the ferry leaving the island and heading to the mainland where most of people live. 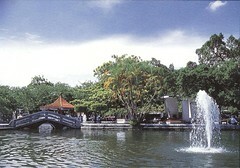 The park is in the northern part of Taichung City. It has such facilities as a fountain. kiddieland, swimming pool, tennis court, and an artificial lake. Taiwan is an island country between Japan and Philippines, on the boundary of tropical and subtropical zone. So it is very suitable for plants to grow. Taipei, my city, is the capital of the country. 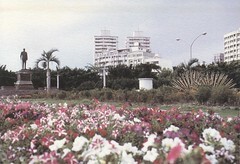 Taichung, the place of this card, is the third big city and about 200 km south of Taipei. Since you said you like gardening. 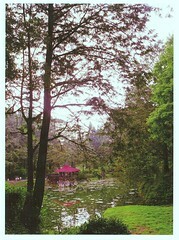 I choose this city park with a flower stamp. 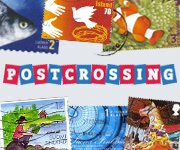 Postcrossing is an international random postcard exchage website. The official site has already explained very well. Please click the link to see detail. I joined on 29 October, 2008. It expands my collection rapidly. Now I have more than one hundred postcards in total. I organise and digitalise all postcards and start to keep the journal too late. 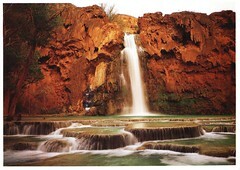 Consequently, it is hard to catch up the coming postcards. But I think postcards are like blog very much. Both need good picture and text. I will try my best to catch up my collection and wish this blog can reach the goal, link to the world. 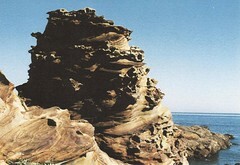 Nanya is noted for its fantastic rock formations and sea eroded coral shore. The entire coastline here is a veritable sculpture garden that illustrates, in stone, the incomparable artistry of weathering and wave action. Taipei City is surrounded by Taipei County. Some people say that the city is special in Chinese world and has its distinguishing characteristic, but the county is cut off by the city and without its own feature. Maybe the wildness and the coast is one of features in the county. I sent this to a German girl who lives inland. I can not imagine how hard people go to see the sea. Formosa is the name given by portuguese voyagers in 16 centry. They shouted out 'Ilha Formosa,' when passed by the island. Taiwan is a long shape island. The west side is face mainland China across Taiwan Strait, and most people live on the plain in west. This postcard is the east coast. I like ocean and the colour blue very much. I wonder how far from your place to the coast. 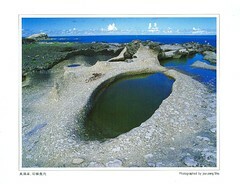 This postcard is about the kettle-hole in Shihtiping in Hualien. Shihtiping is well-known for it sea erosion coast. As I said in the postcard, I like this blue reflection of sky in the hole. Very beautiful. Sky blue brings me a good time. Postcrossing lets me collect a lot of beautiful postcards. But sometimes I feel short of connection with the sender. I found a pen pal to share some feelings. 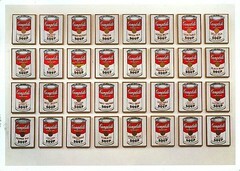 He sent me NY MOMA Campbell's soup cans of Andy Warhol. 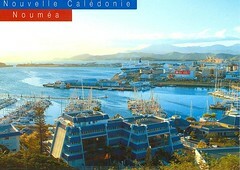 This is what I sent for return, which was bought in New Caledonia in 2007. The postcards Blog of Dodd Lu is inaugurated today. 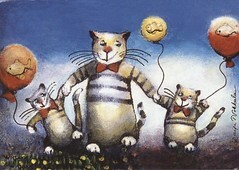 Although I have joined postcrossing since 30 Octobor, 2008, I have been a postcard fan for a very long time. 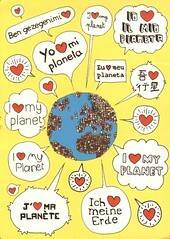 I try to traced back all my postcards, received and sent, but unfortunately, scanning postcards is not a habbit with me. Thus most postcards here are what I received. Well, let those sent cards be the special gift to the receivers. All articles before this announcement are recall of my collection. I shall share more postcards in the future. 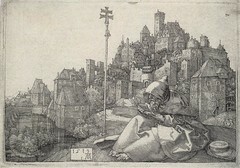 Now I annouce my postcard blog is inaugurated. I was thinking to write a letter to Hsu for his postcard. I saw this ad postcard on the way to the post office. I saw this advertisement and think the subject is interesting. 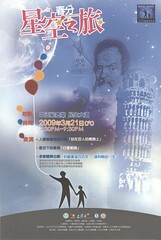 It is a bout a concert of the international year of astronomy, Taipei. 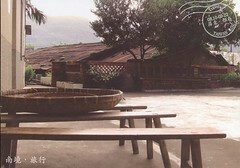 Although Hsu can not attend, I hope he can enjoy his time with clear sky in Penghu when he has a hard time in the military. Hsu is doing his military service now. Since the training stage, I have sent him a lot of mails to cheer him up. After the training, he went to Penghu in March and had two week hard time. Maybe people want to do something different when they have hard time. 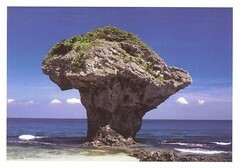 Therefore, I get the first return postcard fromHsu. 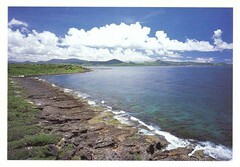 Penghu, the place I served in the CGA. I have so many memories there. 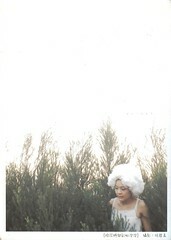 Hsieh has been my penpal from internet since 1 January, 2009. We write to each every two or three weeks. I introduced him to postcrossing by my penpal-wanted ad. I told him that I went to Andy Warhol's exhibition in Taipei in January and he sent this to me, the origin postcard he bought from MoMa, NY. As the chicken soup cans in the picture, getting a postcard is a daily act to me now.